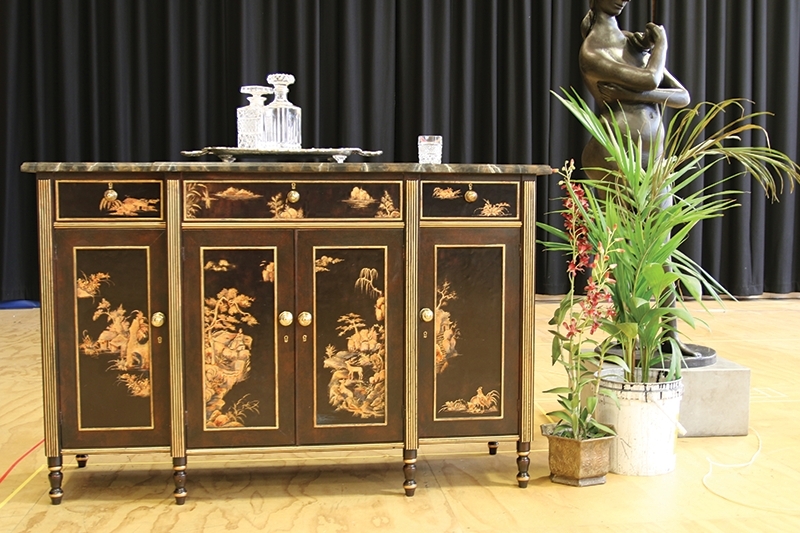 For part two of our I’ll Eat You Last design feature, we explore how our Scenic Artist Tansy Elso transformed a plywood and pine replica cabinet into a mahogany and marble masterpiece. In part one, we learned how Set and Costume Designer Owen Phillips researched the interior design of mansions in Los Angeles and Beverly Hills to find inspiration for Sue Mengers’ fictional home. During his search, he found a stunning antique mahogany cabinet with intricate oriental scenes painted on each panel, which he felt would be perfect for Sue. Since our budgets don’t allow us to import large, very expensive antiques from overseas, we had to weave a little magic. 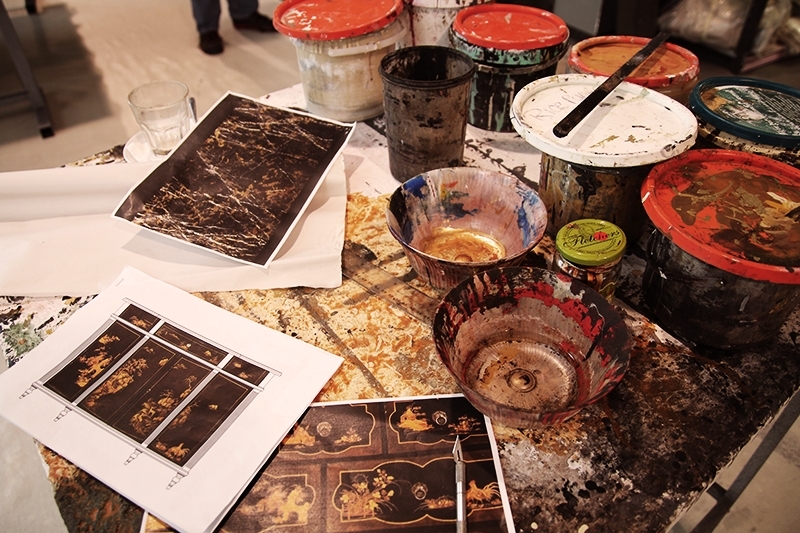 After seeing Owen’s reference images, our Props and Scenic Art teams first had a detailed discussion with the designer, focusing on important aspects of the piece such as colour, finish and sheen levels to make sure everyone had the same vision for how the finished piece would look. With everyone on the same page, our Production Design Coordinator Andrew Bailey used the reference images to create a CAD drawing for a similar design. 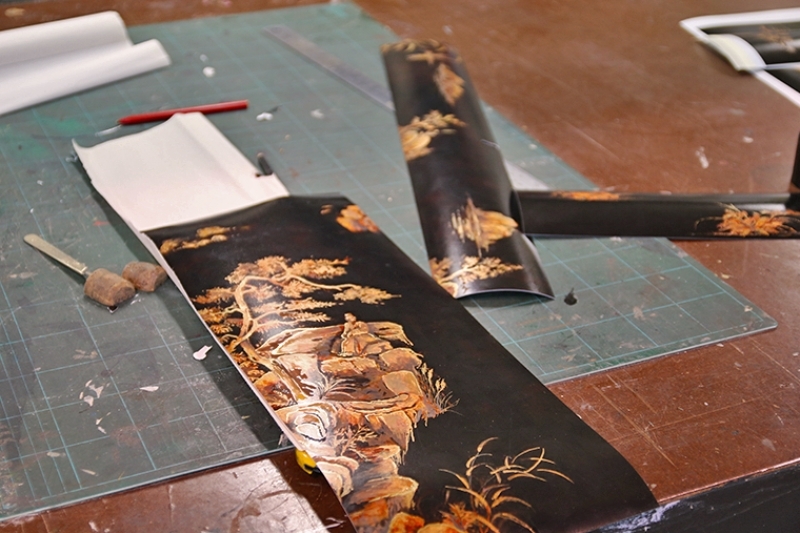 He also manipulated, enlarged and reconfigured the images of the oriental scenes from the original cabinet, which was curved, so that they would fit within the dimensions of the new piece, which is flat. 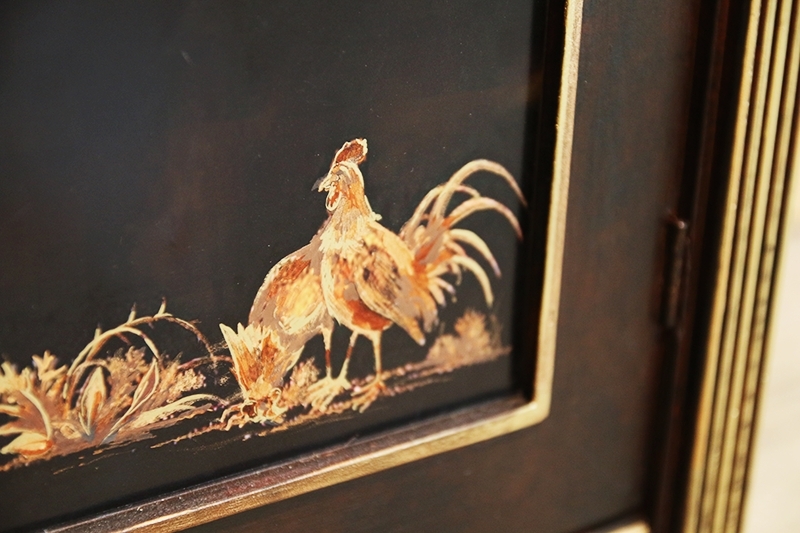 These scenes were printed on to thick stock which gave a blurred template of the image for Tansy to build upon and add detail to, and then adhere to the cabinet. Once our Props team had constructed the cabinet from plywood and pine, Tansy set to work. The first step was to transform the raw surfaces so they had the lustrous sheen of mahogany and the smooth look of marble – a process that required numerous layers of undercoat, filling and sanding. As Tansy explained, plywood and pine are often difficult surfaces to paint because the water-based paints the team uses can raise the grain of the timbers. So the process was a slow and careful one. Scenic Artists usually approach painting by working from light to dark, (unless there is a visual requirement to do otherwise), a process which Tansy shared with us. The marble top was created in a similar way, but Tansy then used rags to create interesting impressions in the surface in order to replicate the movement found in real marble, and applied further transparent washes to create a depth to the surface. ‘When creating something like a marble finish, the organic (and sometimes uncontrollable) nature of a wash of colour can be used to your advantage, because the way the paints dries and pools leaves a surface full of variation and interest,’ Tansy said. With the background established, Tansy added veins of colour to mimic the characteristics of marble. Tansy explains that Scenic Artists always have the audience in mind – they are aware that the audience will see the prop or furniture item from a distance. So to ensure the piece can “read” well on stage, the painting is often bolder, coarser and brighter than a finish would appear in real life. But for a venue like the Fairfax Studio (where I’ll Eat You Last will be performed), the audience are quite close to the stage, which gives them an opportunity to view the set pieces in great detail. No depth or highlights naturally existed within the printed images for the panels of the cabinet, so all this had to be added by hand to enhance the look. Tansy used small, fine brushes and a mixture of gold powder and coloured shellac to add depth and create a lustre and luxurious quality. But perfection is not the aim, she said. ‘Unlike painting a piece of furniture for your own home or a painting to hang in a gallery, an element of a theatrical set, furniture or prop has to tell a story. It has to convey something about the age of the piece or support the environment which has been established by the designer and director. This influences how we approach a piece; whether it is to be modern, old, worn, antique, luxurious, sat on, functional and so on. 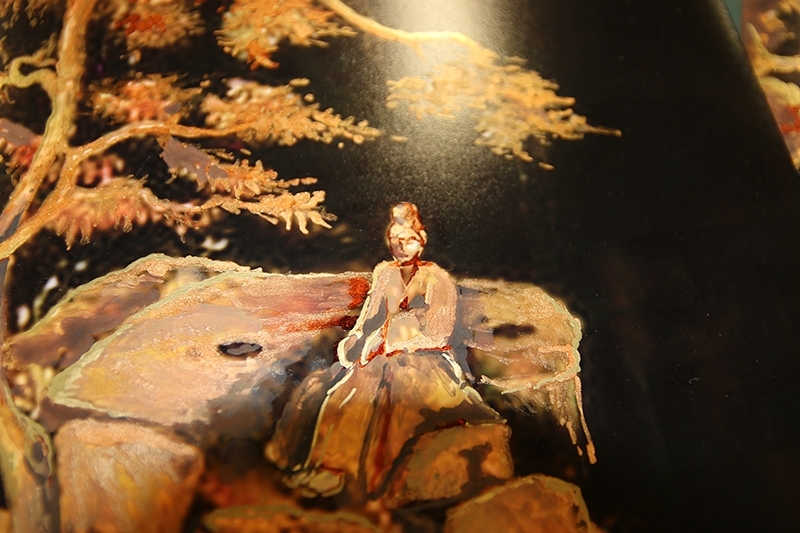 All these considerations must be established to create a fictional story for the scenic element – and through the imagination of the scenic artist, and how it is painted, this is reflected to the audience,’ Tansy said. 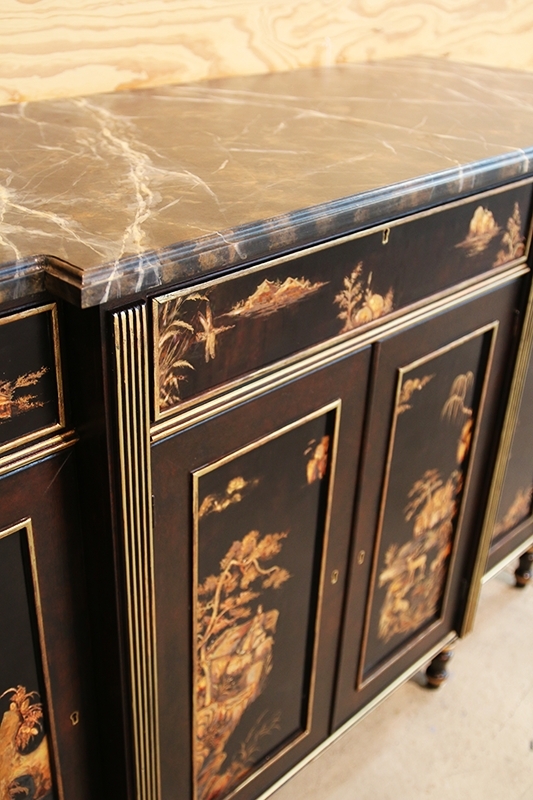 Our cabinet needed to look like a luxurious oriental antique, so wear and tear had be evident in its finished appearance. 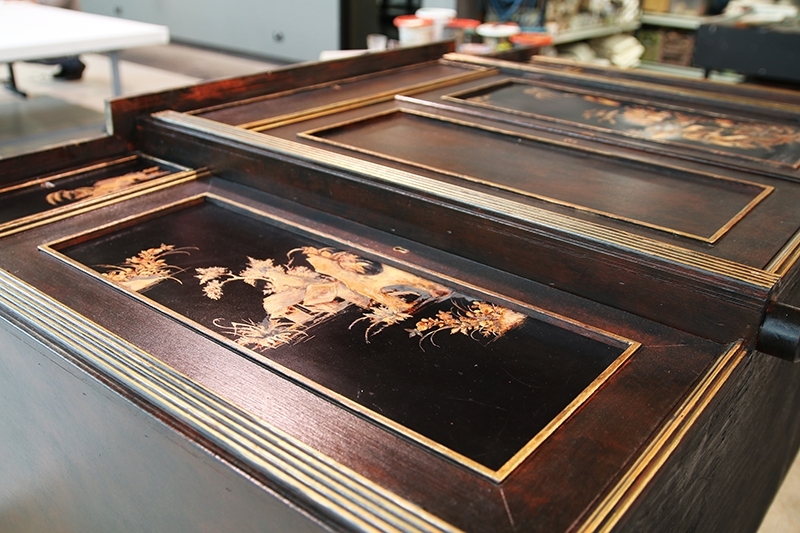 So when applying gilding effects on the cabinet, Tansy used varying tones of gold in broken and uneven bush strokes. Using a gold pen, she added small highlights to some corners of the cabinet, where perhaps the surface would not have been so worn. Brown washes were applied in other areas to tone down the shine and suggest dust or wear, and sandpaper was used to scratch and further break up the surface. It might seem odd to smudge and scuff your work after so much effort, but for Tansy, this is all part of the process. ‘These small considerations that are made when applying paint to a set element really help to convey the story setting to the audience,’ she said. Tansy’s beautiful handiwork, and the rest of Owen Phillips’ set design will be on stage in I’ll Eat You Last from 31 October to 20 December at Arts Centre Melbourne, Fairfax Studio.